Luka Bloom is mining the space between the notes with increasing precision. In Head And Heart he continues the exploration, in intriguing company. The Phil Ware Trio accompany Bloom, but there’s a disconcerting looseness to the arrangements that misses the chance to fully capitalise on the ensemble’s possibilities. Bloom’s song choices are interesting and at times inspired (his reading of Ewan MacColl’s The Joy of Living is just that: a joy). Others grate against their own timeworn fabric (Danny Boy). His guitar lines breathe fresh life into covers of John Martyn’s Head and Heart and the Keith Jarrett-inspired choice, My Wild Irish Rose. His spirit of adventure is palpable, even if his choices disappoint and his encounter with The Phil Ware Trio might have yielded more, given a longer gestation period. The Irish folk singer returns with songs that are noteworthy for their skeletal, laid-bare arrangements and the instrumentation provided by The Phil Ware Trio - Ware on piano, Dave Redmond on double bass, Kevin Brady on drums. Comprised of a number of covers and a couple of Bloom originals, this is an album that keeps its focus on the simple beauty of a great song. Dylan (Every Grain Of Sand), John Martyn (Head And Heart) and Ewan MacColl (The Joy Of Living) are some of the songwriters Bloom pays tribute to in this heartfelt collection. 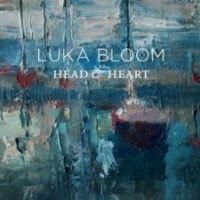 Irish folk singer Luka Bloom returns with a heartfelt portrayal of ten classic songs and two new tracks. Recorded in home studios, Head And Heart sounds organic and honest, featuring beautiful string and piano arrangements. Danny Boy and The First Time Ever I Saw Your Face are perhaps the best-known covers here - as for the two originals, Bloom pays homage to his hometown with Liffeyside and gives tribute to loved ones lost on the haunting Give You Wings. This album is the perfect soundtrack to your next dinner party, a rainy afternoon, or a great gift for Nanna's next birthday. On his latest album, Irish singer/songwriter Luka Bloom continues to balance his own songs with imaginative covers of material from some of his favourite songwriters and clever arrangements of well known classics. On six of the 12 songs, his acoustic guitar is complemented by a jazz trio (piano, double bass, drums), breathing fresh life into John Martyn’s title track, Gentle On My Mind, And I Love You So and The First Time Ever I Saw Your Face. A standout track is his own composition, Give You Wings, the story of families dealing with a life-changing-tragedy.